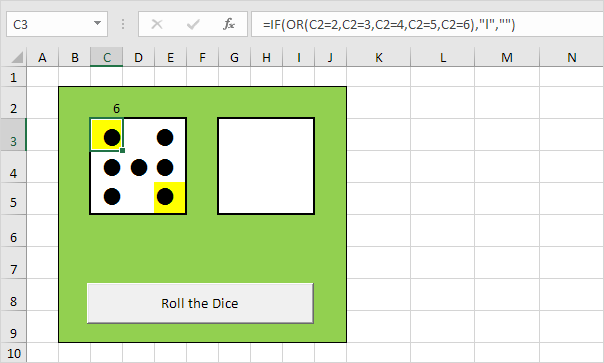 This example teaches you how to simulate the roll of two dice in Excel. If you are in a hurry, simply download the Excel file. 1. At the moment, each cell contains the letter l (as in lion). With a Wingdings font style, these l's look like dots. 2. Enter the RANDBETWEEN function in cell C2. 3. 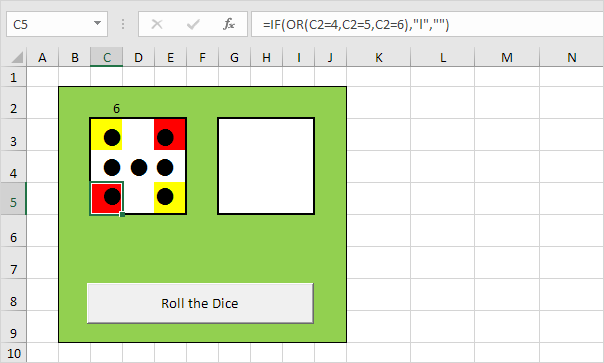 Enter the formula shown below into the yellow cells. If we roll 2, 3, 4, 5 or 6, these cells should contain a dot. 4. Enter the formula shown below into the red cells. If we roll 4, 5 or 6, these cells should contain a dot. 5. Enter the formula shown below into the blue cells. If we roll 6, these cells should contain a dot. 6. Enter the formula shown below into the gray cell. If we roll 1, 3 or 5, this cell should contain a dot. 7. Copy the range C2:E5 and paste it to the range G2:I5. 8. Change the font color of cell C2 and cell G2 to green (so the numbers are not visible). 9. 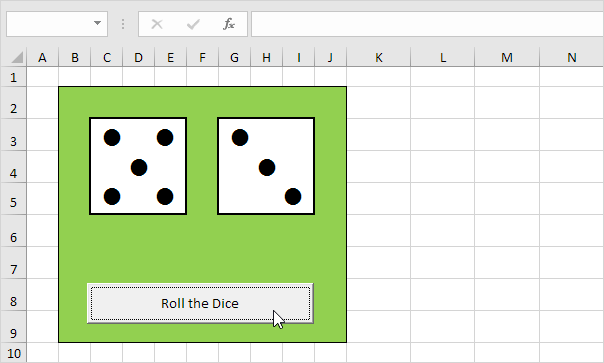 Click the command button on the sheet (or press F9).